Sababa Carriage House -- Close to Beach!!! Relax at Sababa -- perfect location in Rosemary! 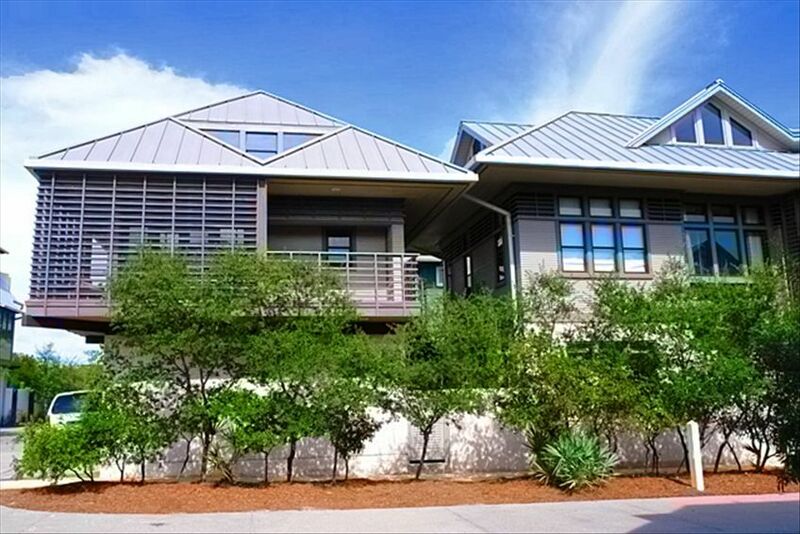 A beautiful, bright, and airy carriage house that is just a 2-3 minute walk from the magnificent white sands of Rosemary Beach. Walk the same distance in the other direction to Rosemary's gorgeous Coquina pool, one of five pools in the community. Located on the desirable south side of Highway 30A, this professionally-decorated carriage house has one bedroom with a queen size bed, one full bathroom, a loft with queen size bed and television, full kitchen, dining area, and living/family area with television. In addition, there is an outdoor shower and a washer/dryer is located in the garage. Enjoy your morning coffee on the screened-in deck while listening to the sounds of the ocean. Need more room? Not a problem! This carriage house offers full privacy. It is separate from the main cottage, so you will not be sharing common areas or amenities with another family. Bicycle rental is available, as well as use of the fitness center, tennis courts, and salon/spa. Come and enjoy a Sababa vacation! While you're there, walk over to the center of Rosemary where you can shop, dine, or just grab a cup of coffee while you plan the rest of your time in this truly unique community. We are a family of 4 who loves the beach! When we first came to Rosemary Beach 4 years ago for a wedding, we fell in love with the place. Having traveled the world, we knew this was one of the most beautiful spots we could ever find and became intent on owning a home here. Our home is steps from both the beach and a beautiful, large, negative-edge pool -- both are about a minute away. It's just a short walk to the main square in Rosemary. Once we're here, we find ourselves getting around more by bicycle than by car. The house itself is spacious, bright, and open. Most of the deck is screened-in. Deck is furnished. 1-2 minute walk to Rosemary's Coquina Pool. Two color TVs, 2nd bed in loft; dining area; living room. We had a wonderful stay at the Sababa Carriage House. Fantastic location, very convenient to the beach and pool. Owners are very attentive and whole experience was fantastic. We loved everything about this carriage house. It’s the perfect set up for a family with small children. As advertised, it’s very close to the beach and pool...and there’s a great playground next door. All the restaurants and shops in Rosemary are are within easy walking distance as well. We’ll definitely be back. Very cute carriage house! Good location with easy access to beach, pool and dining. Our only complaints are regarding parking and the master bedroom mattress. Parking was extremely difficult due to the garage parking pad being taken up by an oversized subarban driven by the renters of the main house. We could have fit in the garage but couldn’t access it. We parked on the gravel pad in front of the subarban when we could fit. Thank you for your review. We're so glad you enjoyed your time at our carriage house! Regarding parking, our spots are reserved for renters only. Any other vehicle must be moved. When something like this happens, if the renter calls, texts or emails me we immediately contact the owner of the vehicle or (if we don't know or can't contact the owner) we call Rosemary security and see to it that it is moved. Fortunately, this isn't a common problem but whenever it's happened in the past we've corrected it asap so that our renters don't have to worry about parking. We're also sorry the mattress wasn't as comfortable as you would have liked, and are ordering a new one. We hope you'll be back sometime to try it out! Such a cute place. Loved it! The owner is really awesome to work with. Will be back next year for sure. The carriage house was perfect for our family with two small children (7&8). My girls loved their upstairs “room”. It had everything necessary for our stay including a washer and dryer in the garage, but could use a hand vacuum for the rug and sofas. The water pressure in the shower was amazing, Upstairs is warmer than downstairs and fans were helpful to keep upstairs cool enough for a good sleep. Beds were very comfortable. It is walking distance from the beach, pool and a just step away from the playground. We rented bikes and drove to the main square and restaurants in a breeze. Sababa is in a great location in Rosemary -- On the south side of 30/A we are a very short walk to beach and Coquina Pool; playground nearby. 5 minute walk to town center. Rates does not reflect holiday pricing. Please inquire for rates on major holidays (e.g., Christmas, Thanksgiving, etc.). Price includes a damage/security deposit of $500, and is refundable within 7 days of check-out.